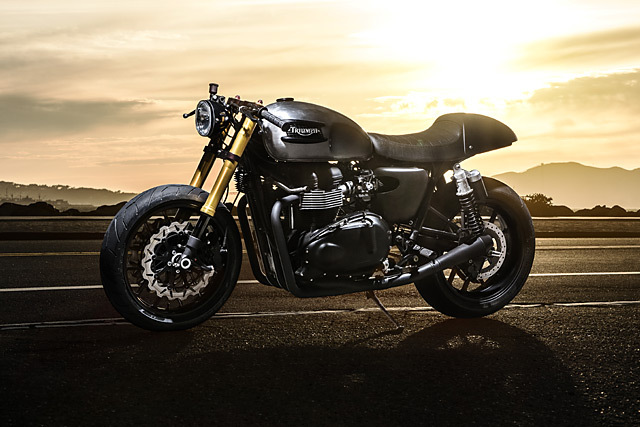 In the café racer scene few motorcycles are as important as the parallel twin-powered Triumph Bonneville. 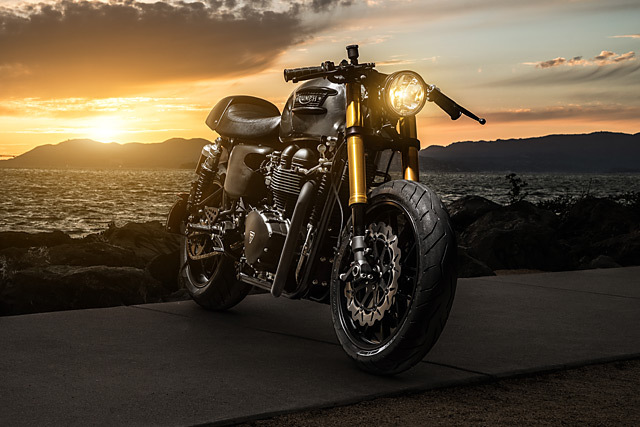 From the early pre-unit bikes, to the engines that powered Tritons and Tribsas, all the way to the modern re-imagining of the Bonneville that you can buy new off the dealer floor; the bike has pretty much defined the scene. Now, we all have our opinions and right now this is mine; I believe this is the best looking Bonnie ever built, bar none. 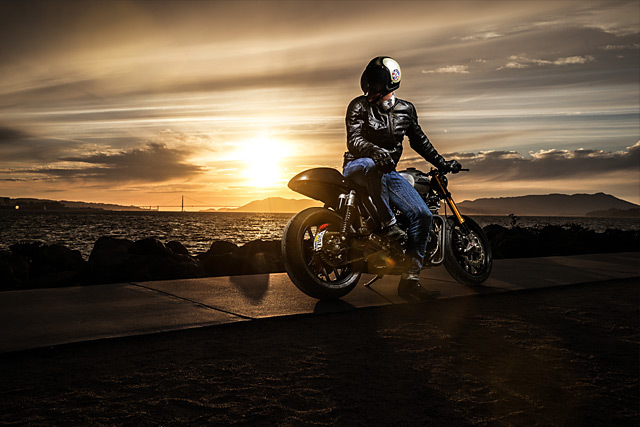 Built by Patrick Flynn from California it was the inspiration for his long running blog, The Bullitt, which was started to showcase the build and many incarnations this 2005 Triumph Bonneville in factory black has gone through. But it is this final form that I believe works so incredibly well; the modern gold forks, the classic looking raw metal tank, the beefy rubber and the clean lines. It’s for sale and I want it. The original tank has been stripped of its black paint and the bare metal of the tank clear coated to give it the best of British look. 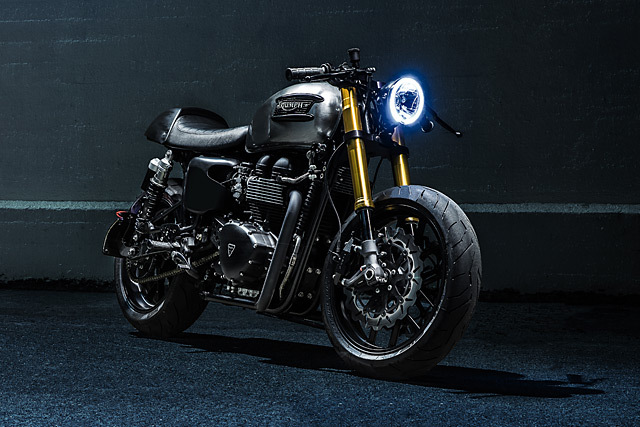 To further accentuate the look the factory badge work has been blacked out along with many other components like the gas cap, the carby tops, heel guards and the Thruxton rearsets. 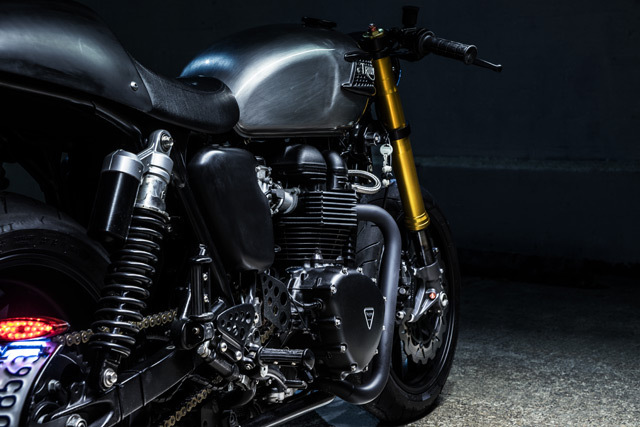 A Thruxton also donated its seat to the cause and you guessed it, a blacked out seat cowl sits out back. Even the remote canisters on rear shocks were painted black, all of which perfectly contrasts with two simple elements, the raw metal of the tank and those gold forks. When Pat decided he wanted to do an inverted fork upgrade on his Triumph few had been attempted and certainly nobody local to him had the runs on the board to guide him through the process. But Jason at British Customs certainly has the know how to make new ideas not only work, but function the way they should. Jason had a set of triple trees that would do the job in fitting the Suzuki GSX-R 1000 forks to the Triumph frame and the key change was pressing in a Bonnie stem to the new triple trees. With massively improved suspension out front with adjustability now an option it made sense to fit equally capable shocks out back and a set of KYB ZRX1200 items do the trick just nicely. With a stock Bonnie front end in his hands Pat made another great move, he swapped it with Jason for a beautiful set of now black 17″ Carrozerria wheels. Reducing unsprung weight is often overlooked and with the machining of some new spacers and a set of new steering head bearings the new combination was dialled in. Further reducing the weight and giving some serious braking improvement over the stock Triumph items are the Dual Galfer wave rotors clamped by the Suzuki spec Tokico calipers. The rear brake is standard, but has had the inside diameter blacked out the match the rest of the machine. 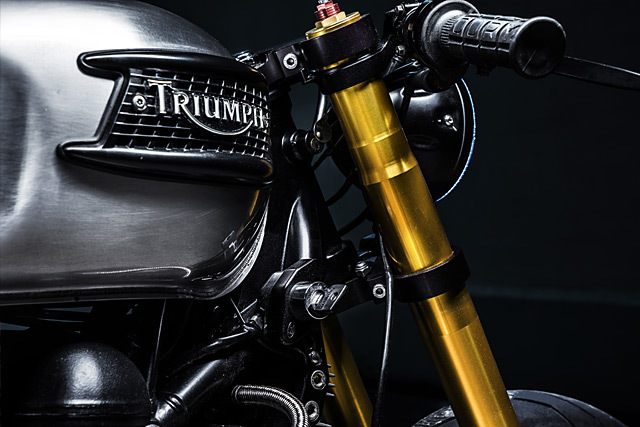 Control is taken care of by a British Customs direct-mount hydraulic brake reservoir with custom front lines to match the new front end conversion. The final addition to the rolling stock was a sticky set of Pirelli Diablo Rosso Corsa II tyres, 120 up front and a meaty 180 section at the rear. 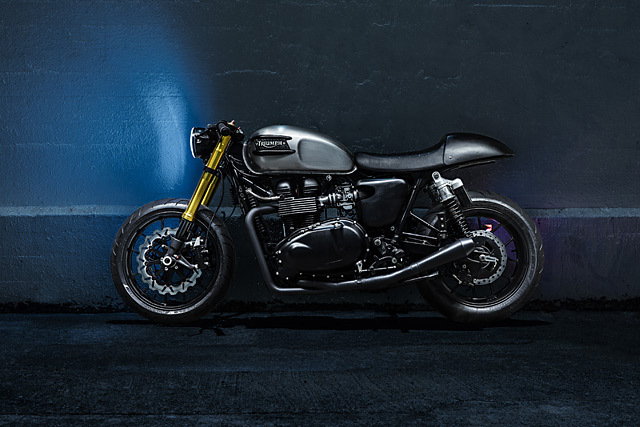 The parallel twin engine fitted to the modern incarnation of the Bonneville is a sweet little performer bringing a modern touch to the much-loved engine of old. Sure it doesn’t pack a Panigale-like 200bhp, but that’s not the point, Triumph have built an engine that produces peak torque at an RPM where most 4 strokes are still drawing breath. 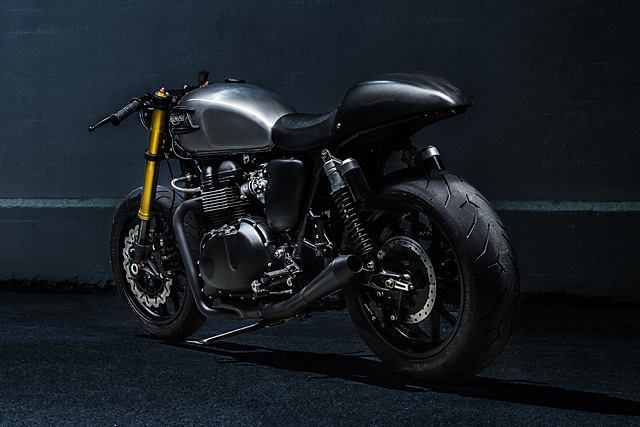 To add some extra ponies up top and let the motor sing at full pitch Pat has fitted a British Customs 2-into-1 exhaust that has been ceramic coated in black. It not only looks great but ceramic coating keeps exhaust gas speed high and leg burns to a minimum. A British Customs airbox removal kit has been fitted and in its place are a pair of K&N pod filters, visible through neatly cut side covers. Pat started the build by pulling the many “unwanted” components of the bike off, mirrors, fenders, gauges… who needs them! And despite the many guises this particular bike has taken on, classic minimalism has always been a common theme. 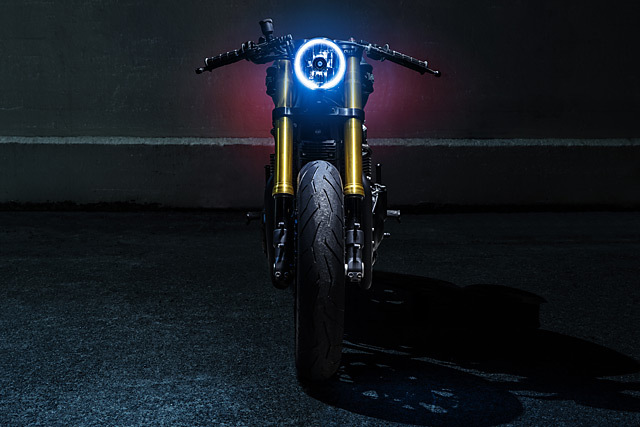 The Suzuki clip-ons wear Oury grips, blacked out levers and little else, while a 5-3/4 Halo headlight (with LED ring) lights the way for this Bonnie beast. To clean up the look even further Pat went to the extent of fitting a Joker ignition relocation bracket with hidden ignition button, British Customs license plate relocation kit with cat eye rear taillight and British Customs rectifier relocation bracket. The result is style that comes from the amplification of function while carefully concealing anything that intrudes upon the form. It’s a back to the future Bonnie with all the right fruit and if you pulled up at the Ace Café any time in the last 70 years on this Triumph you’d turn as many heads standing still as you would thundering down the road, with the speedo heading for the Ton.